Description: Alice takes clay for her stones and crochets silver for her bands - for a truly marvelous result! I crochet a lot of my jewelry and use clay for stones. Sometimes I use other fake plastic gemtones. On the one with the humming bird... 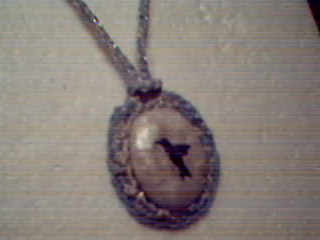 It's a clay stone with a humming bird picture decoupauged on it, and a crocheted lace look backing in silver crochet thread and silver crocheted chain for the necklace part. Second one is silver and white crochet cotton, with fake gemstones glued on. I agree with Gabriella, your jewelry looks like it's very pretty, but the pics don't do it justice. 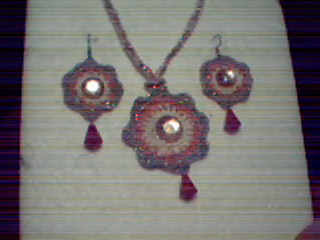 I think the jewelry are very nice in real, but in these pictures I only guess what it is. I really whould to see the crocheted one, because I'm charmed by this type. Just beautiful! I wish I could remember the crochet lessions I had from my grandmother when I was 8! I love these. They are so unique. I bet a newborn bracelet for mom and baby would be outstanding! !